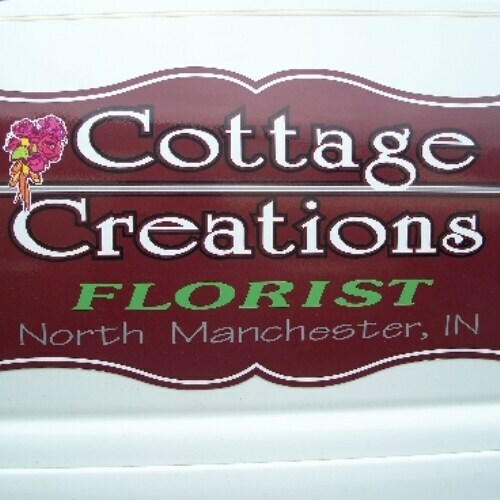 Cottage Creations Florist proudly serves North Manchester, Indiana and surrounding areas. Under new ownership as of April 1st, 2015. We are still family owned and we will continue the tradition of operation since 1983. We are committed to offering only the finest floral arrangements and gifts, backed by service that is friendly and prompt. Because all of our customers are important, our professional staff is dedicated to making your experience a pleasant one. That is why we always go the extra mile to make your floral gift perfect.Let Cottage Creations Florist be your first choice for flowers for all occasions. *Our shop is open Monday through Friday: 9:00 a.m. to 5:00 p.m and Saturday: 10:00 a.m. to 3:00 p.m. Closed Sundays. To ensure exact product availability, please order 2 weeks prior to delivery date. To help assure on-time delivery during the busy holiday season, place your order at least 5 days prior to the following major holidays: Thanksgiving Day, Christmas Day, New Year's Day, Valentine's Day, Easter, Administrative Professionals Week, Mother's Day, Memorial Day, Father's Day, Independence Day and Labor Day. For your ordering needs, or if you would like to order something different, please call us directly at (260) 982-2028. We're here to serve you and make your flower-sending experience a pleasure. We want to meet your gift-giving needs for any occasion. We strive to meet your gift-giving budget. For personal service, feel free to contact us directly during our regular business hours Mon - Fri 9-5 and Sat. 10-3. Thank you. For fastest service, call 260-982-2028. You may wish to save on delivery fees by calling us with your order directly or by emailing your order to us with a contact telephone number. We also carry in our brick and mortar store, lotions, jewelry, purses, scarves, angels, plants, silks, home decor items, etc. We can deliver these items as well to someone special upon request. Thank you. For in-town delivery, please add $5 to each order per address. For R.R. and other town deliveries, delivery fee varies. Please call for rate quote. U.S. orders must be received before 12:00 noon in the recipient's time zone to assure same-day delivery. Orders received after that time may with exceptions of some funerals, and be delivered the following day. With the exception of funerals, we are unable to make private deliveries on Sundays. Deliveries requested on this day will be delivered the following business day. Delivery of orders to rural route addresses or cemeteries will not be guaranteed unless accompanied with an accurate telephone number and complete description and photo.